Rosewall Hill, looming. Digital painting. Between visitors to my recent exhibition, Beneath the Surface, in King’s Lynn, I thought I’d make good use of any ‘downtime’ and try out the digital painting app ArtRage on my iPad. It took a few attempts to get the hang of, but it’s becoming compulsive and I like to think it may have a positive effect on my use of colour and mark-making. Anyway, these are some of the results, inspired by a day spent exploring the surrounding moorlands and remains of the Levant and Geevor tin and copper mines in Cornwall on a recent St Ives holiday. The two digital paintings above are the latest ones and I think I’ve learnt to exploit more of the subtleties of the tool/colour/effect options of the ArtRage app since I produced the first examples below. I’ll probably always prefer to use physical paint on paper or canvas, but in situations like this in places where I don’t want to make a mess or leave work drying while I talk to someone, the iPad might make a useful sketchbook alternative. Geevor Mine, Pendeen. Digital painting. Levant: verdigris leach. Digital painting. 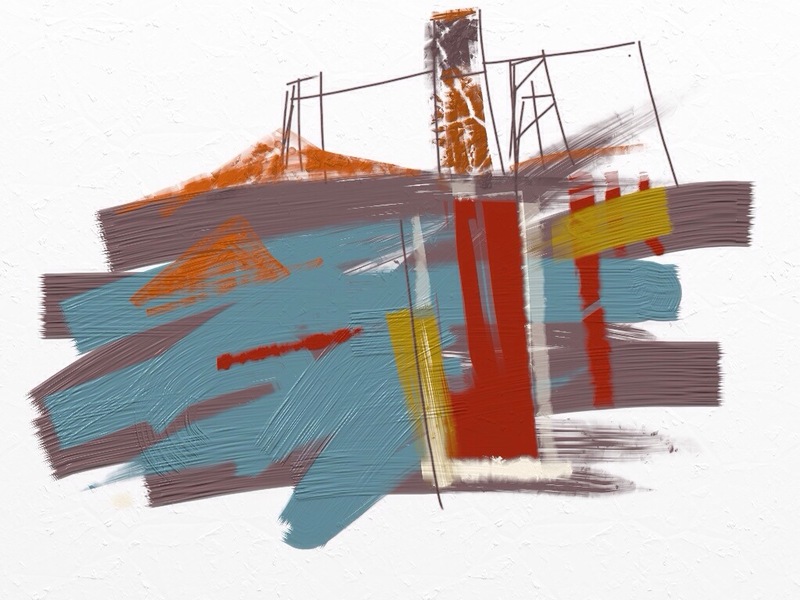 This entry was posted in abstract, art, Cornwall, digital painting, industrial archaeology, landscape and tagged abstract, art, ArtRage, copper mine, cornwall, digital artwork, digital painting, Geevor mine, iPad, iPad app, Levant mine, painting app, Pendeen, sketchbook alternative, St Ives, tin mine, verdigris by mari french. Bookmark the permalink. Mari, I really really like these & enjoy the fact that when I learnt that they were done on an iPad, I thought to myself….aah! thats it, however I didn’t know you could do this on a computer. There is a loveliness to the computer generated-ness quality that I can’t quite explain. Very pure & filtered almost, I don’t know and could go round in circles here, but won’t, but I can’t stop looking at them. That’s lovely Sam, it’s thrilling to me that you get such pleasure out of them. I had always assumed I’d find digital painting a bit cold and clinical, but I’m surprised by how fulfilling it can be … it’s just another way of expressing my reactions to a subject after all isn’t it. I’ve used Photoshop a lot in my former life as a graphic designer but, possibly because these weren’t produced for a commercial reason, they felt entirely different to work on. It will be interesting to see if I feel differently when (if) I use the app for sketching from life. These were done entirely from memory.